It’s been a while, but here are a few photos. 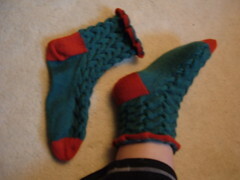 First an update – been busy at work, been knitting socks, been putting up Christmas decorations. I’ve had an on-and-off cold, which seems to be clearing up now (touch wood), and I’ve had a few bad pain days. On Monday I’m off to see the consultant and plead for help, and on New Year’s eve I’m seeing someone in the pain clinic to borrow a tens machine. There are only 3 working days now until the xmas break, then I’m off until 5th Jan. Hooray! I love the colour, and the variety of the pattern – leaf lace up the front, ladder lace up the back and eye of partridge heel. 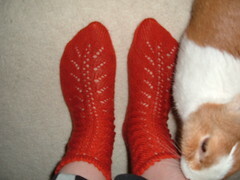 They are also really soft and comfy and I’m really pleased with them. 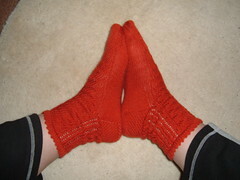 I finished the first one, but it wasn’t quite long enough in the foot. I got on with the second sock, making the foot a little longer than the first, then unpicked the toe of the first and made the cabled bit just half a repeat longer. I didn’t plan it that way, but they turned out really Christmassy – brilliant at this time of year! The green and red aren’t really Christmassy on their own, but together, they work somehow. On to the next – I’m starting yet another pair of socks, for myself again. 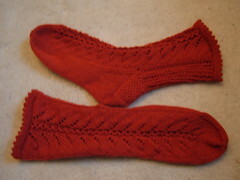 I don’t know when I became such a selfish knitter, all I want to do is knit myself socks! 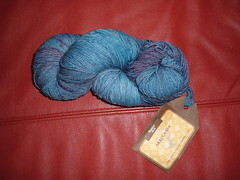 This next pair will be using the lovely Araucania yarn I treated myself to for my birthday. I think I’m going to make Waving not Drowning, a free pattern from the Violet Green website. This is the website I’m planning to spend my Christmas present money on, when we eventually have enough to spare. The plan is, we’ll agree a set amount to spend, and each buy ourselves something we really want. Mmmmmm…sock yarn! 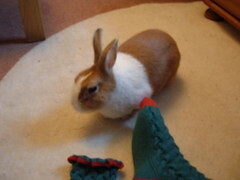 Finally, before I go and cook a stir fry for our dinner, here are a couple of pictures of that damn rabbit ‘helping’ me to take photos of my socks! This entry was posted on December 20, 2008 at 7:08 pm and is filed under Health, knitting, Rabbit. You can follow any responses to this entry through the RSS 2.0 feed. You can leave a response, or trackback from your own site.